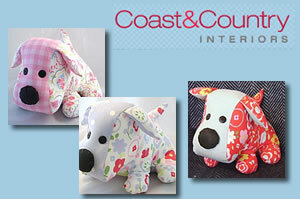 In May last year, we discovered Cost and Country Interiors and their remarkable collection of funky dog door stops. We recently re-visited their website and we were delighted to find new additions to their handmade doorstops collection and some price reductions too on our favourite dog doorstops! Rich with color, each individual dog door stop is made with 2 different cotton fabric patterns, has a lovely large size with huge black nose, and 2 button eyes. The collection includes 9 models with price starting from £17.50 compared to £23 in May last year. It is difficult to choose amongst all these adorable handmade door stoppers but our favourite one is the Blue Flower Dog Doorstop with his spotty head and floral cotton fabric print – it has a real Cath Kidston feel! It is pity that CoastandCountryInteriors.co.uk don’t sell matching draught excluders for this specific puppy door stop but they do have some sausage dog draught excluders in a similar style. They are cheaper and are reduced by half price. With prices from £14.99, we think it is a bargain! Our best pick are the Chirpy Cream Chicken Draught Excluders, handcrafted with from recycled fabrics. These are made from recycled Witney blanket material and beautifully hand appliqued using dress fabrics and embroidery. The draught excluder measures 78 cm x 18 cm approx but please note that each is unique and individually styled. Handmade doorstops and draught excluders only represent a fraction of their collections – their lovely website is definitely worth a visit! To browse our range of door stops, please visit the Door Stops section.